When Indianapolis Power & Light Co. flipped the switch on its new $600 million natural gas plant in April — a project built on the site of a shuttered 1950s-era coal plant — the occasion marked a shift for the Midwest utility that traces its history back more than a century. Just a few years ago, IPL, a unit of AES Corp., burned coal for 80 percent of the electricity sold. 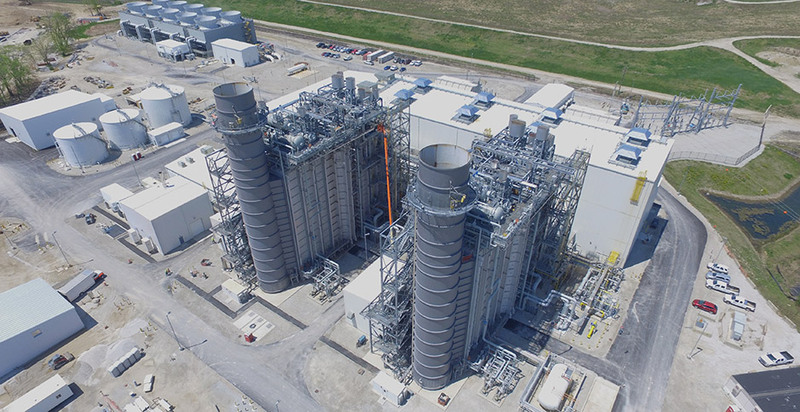 With the addition of the 671-megawatt Eagle Valley plant southwest of Indianapolis, natural-gas-fired capacity today represents 45 percent of the utility's fuel mix, nudging out coal. It's the same story across the Midwest, where utilities long tied to a grid of central coal plants are accelerating the shift to cleaner energy. The transition means big investments in renewables and energy efficiency programs to slash energy use. But some utilities are also asking regulators to approve a new wave of natural gas plants that can offer so-called dispatchable energy whenever it's needed. Several Midwest utilities have sought or received approvals for new gas plants in the past year, including another in Indiana, Vectren Corp. More such proposals are anticipated as companies pull the plug on old coal burners. With each new proposal has come increasing pushback from environmental groups citing the impact of greenhouse gas emissions — both from burning gas and producing it. Consumer advocates, too, are questioning the need for the huge investments and whether there are lower-cost alternatives. Opposition to new fossil power plants from environmental and consumer groups isn't new. What is changing, however, is the economics of alternatives. Wind and solar costs, aided by federal tax incentives, continue to fall since the IPL plant was approved four years ago; also, there's a surplus of generating capacity on the grid, and electricity demand continues to erode or at least remain flat. The combination of market factors means big bets on new gas-burning plants are a tougher sell to regulators than they were even a few years ago. And that's before battery storage becomes a real player in the Midwest as costs continue to drop. "If you look at the problem the right way and ask: 'What does the grid really need?' It's not gas," said Mark Dyson, a principal in the electricity practice at the Rocky Mountain Institute. "It's energy, capacity, flexibility and other grid attributes. And there are combinations of alternative resources that can provide that and more as long as you can figure out how to represent that and value it in your planning process." Dyson was co-author of a study in May that looked at just that issue — how renewables and distributed energy can be more effective alternatives to the "default" option for utilities, natural gas generation, in search of a replacement for retiring fossil and nuclear plants. The report concluded that replacing gas, coal and nuclear capacity with natural gas through 2030 would cost $500 million, carry at least $400 million in fuel costs and lead to the release of 5 billion tons of carbon dioxide emissions over the same period. So far, no utility commission in the region has denied a utility permission to build a new natural gas plant. In a ruling this spring, Michigan's Public Service Commission approved a controversial proposal by DTE Electric Co. to construct a $1 billion gas plant just outside Detroit that will help replace coal units being shut down in the coming years (Energywire, April 30). The PSC sided with DTE over a coalition of clean energy advocates that argued that a portfolio of renewable energy, energy efficiency and demand response represented a cheaper, cleaner and less risky choice to meet the utility's capacity and energy needs. The decision is being challenged at the Michigan Court of Appeals. But earlier this month, an administrative law judge in Minnesota concluded that the state's second-largest investor-owned utility, Minnesota Power, failed to prove the need for a $700 million gas plant. In the 130-page report, the judge found that the utility didn't adequately consider alternatives to the gas plant for capacity and energy. The Duluth-based utility, a unit of Allete Inc., created a joint venture a year ago with the Dairyland Power Cooperative to build the 525-MW plant. Minnesota Power would be entitled to 250 MW if the PUC approves it. A decision is expected this fall. Minnesota Power has shown no signs of giving up its pursuit of the project. Spokeswoman Amy Rutledge noted in an email that the administrative law judge's order isn't binding and that the Minnesota Department of Commerce recommended approval of the plant. The utility, she said, has gone from relying on coal to produce 95 percent of its energy in 2005 to being a leader in renewable energy, which now makes up about 30 percent of its fuel mix. The gas plant is part of a broader strategy to reach 44 percent renewables by 2025. "We believe natural gas plays an integral role in the transformation of our fleet," Rutledge said. Part of Minnesota Power's case for adding gas-fired generation is the need for "dispatchable" generation that could be ramped up and down to follow demand and variable wind generation during the day. But the judge determined the utility overstated the need for generation that could be ramped up and down, partly because it didn't fully account for how being part of the Midcontinent Independent System Operator's regional bulk power grid could help address those needs more efficiently than operating its own system in isolation. Allen Gleckner, director of energy markets for Fresh Energy, a Minnesota advocacy group that's challenging the need for the plant at the PUC, said while the state's energy mix is evolving, renewables still make up just more than 20 percent of the energy mix. Until the penetration of wind and solar reaches a much higher level than is even being contemplated by Minnesota utilities, there's a menu of cheaper, cleaner solutions to integrate increasing amounts of renewable generation. "There are all kinds of ways to make this work without adding expensive gas," he said. "The timelines we're looking at are pretty far out ... so we don't need to be making those huge, chunky, volatile investments." Back in Indiana, state regulators held a public hearing Wednesday night on Vectren's proposal to build an 800-MW natural gas plant at the current site of the A.B. Brown coal-fired power plant at the state's southern tip. Vectren, which is being acquired by CenterPoint Energy, said the $900 million project, which would include the cost of a new gas pipeline to supply fuel, is needed to replace energy and capacity from two coal plants the company plans to shut down in the coming years. The gas plant is part of the company's Smart Energy Future strategy, which also includes 50 MW of solar. The utility said the combination of solar and gas would slash carbon emissions by 60 percent from 2005 levels. The gas plant proposal, which was the subject of a public hearing in Evansville, Ind., Wednesday night, is stirring opposition from strange bedfellows — the Indiana Coal Council Inc. and the Citizens Action Coalition, an environmental and consumer advocacy group. Kerwin Olson, executive director of the Citizens Action Coalition, said the looming retirement of Vectren's A.B. Brown and Warrick coal-fired plants presents a key energy policy question for Indiana — one he thinks should wait until the utility's new owners take over. "Why don't we hit the pause button and wait for CenterPoint to come in?" he asked. Ultimately, he believes the answer is a combination of clean energy investments and taking advantage of excess capacity in the Midcontinent Independent System Operator market. "We think that we can retire these coal plants on schedule," Olson said. "But there's no urgency here. There's available capacity, there's available energy. Condemning ratepayers to another $1 billion is just shortsighted and irresponsible." Clean energy groups aren't just appealing to concerns about climate change or pocketbook issues. They're also hoping to get the attention of utility shareholders by arguing that investments in renewable energy can mean bigger returns for investors. That's because when a utility builds a natural gas plant, it earns a return on the capital invested but not the fuel costs, which are passed through to consumers. But with wind and solar, it's all capital investments. That idea is at the core of Xcel Energy Inc.'s steel for fuel strategy in Minnesota and Colorado, where the utility is retiring coal plants and replacing them with wind, solar and storage. Dyson of the Rocky Mountain Institute thinks utility executives will regret not following a similar path as prices for renewable energy, and especially battery prices, continue to drop. "I would hate to be the utility that puts $1 billion in a new gas plant given the declining price trends in storage," he said.